Figure skating fans that missed the 2016 U.S. National Championships last month won’t have far to look to see the winners perform again. In all, six medalists, including the Men’s, Ladies’ and Ice Dance champions, will join the 2016 Stars on Ice tour. The show will visit six cities nationwide beginning in Hershey, PA on Friday, April 15th. For a complete list of tour dates and performance times please visit www.starsonice.com. Gracie Gold reclaimed her place as U.S. National Champion in an exhilaratingly close victory over Polina Edmunds, with last year’s champion, Ashley Wagner finishing third. All three will join the tour after competing in Boston at the 2016 World Figure Skating Championships. They will perform alongside the brother/sister 2016 U.S. National Champions Ice Dance team of Maia & Alex Shibutani, and the couple they bested, 2015 U.S. National Champions Madison Chock & Evan Bates. Adam Rippon, fresh off his back-to-back World Junior Championships, skated as a guest during the Stars on Ice show in Wilkes-Barre, PA near his hometown of Scranton, in 2009. Now, after finally succeeding at becoming the Men’s U.S. National Champion, Adam joins the cast for the entire 2016 tour. 2016 will mark the 30th anniversary of the Stars on Ice tour. The Emmy Award-winning production’s celebration tour will be graced with performances by 2014 Olympic Ice Dance Gold Medalists Meryl Davis & Charlie White. They will be joined by the six World Championship contenders, as well as two other decorated American male skaters, four-time U.S. Champion and 2014 Olympic Bronze Medalist Jeremy Abbott and U.S. Champion Ryan Bradley. 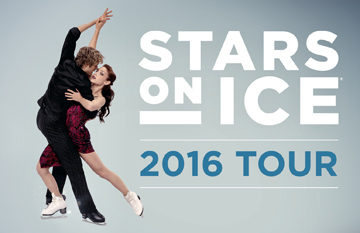 Tickets for the 2016 Stars on Ice tour are on sale now. Limited on-ice seating is available upon request. Tickets start at $25 and are available via www.starsonice.com. Group discounts are available for parties of 10 or more. Please visit www.starsonice.com for the most up to date information, as well as exciting show announcements.